The Metal Samples hot tap tool provides a safe and reliable method of hot tapping high pressure access fittings on pressurized pipelines or vessels. A special cutter assembly is installed in the access fitting, previously welded onto the pipe. To tap a hole through the pipe wall, a service valve is installed on the fitting. This allows the cutter fitting to be isolated, if necessary. 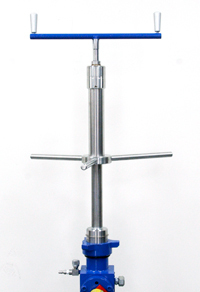 The hot tap tool is mounted on the service valve and mated to the cutter. The drive screw on the hot tap tool puts pressure on the cutter as the tool shaft is rotated to cut through the pipe wall.After the hole is cut through the pipe wall, the tool is removed from the valve and the retrieval tool is then used to pull the cutter assembly and pipe plug from the fitting. Shavings and cuttings are removed using swabs or brushes. The hot tap procedure may be expedited by use of an air operated drill motor to turn the cutter shaft. Safety is enhanced in the Metal Samples assembly because the cutter is isolated from the atmosphere by a service valve. At any time in the procedure, the cutter drive shaft may be retracted and the fitting and its contents isolated from the atmosphere by closing the service valve. The HP™ hot tap tool is designed to be used with 5.25" HP™ Flareweld or Buttweld access fitting systems. The MH™ hot tap tool is designed to be used with 5.5" MH™ Flareweld or Buttweld access fitting systems. HP™ and MH™ are trademarks of Metal Samples Company. These items are furnished as standard equipment with each complete Hot Tap Tool Kit. In addition, a 3/16" punch, large crescent wrench, large screw driver, etc., are required. Spares and replacements can be ordered using the ordering fields below.